Will I be admitted to USF? It is important to know that each application is reviewed individually and acceptance decisions are rendered based on academic preparedness as indicated by your GPA and standardized test scores. For full acceptance a student should achieve a minimum 2.8 high school GPA on a 4.0 scale, accompanied by an ACT score of 20 or higher. Transfer students should have a 2.5 cumulative GPA. If you do not meet these criteria, we still strongly encourage you to apply as there are varying levels of acceptance. We also encourage students with exigent circumstances to provide supplemental information in the form of essays or letters of recommendation. If you are a prospective student with a disability and need assistance or accommodations during the admission/application process, please contact the Director of Learning Accessibility Services at 605-331-6648 or access@usiouxfalls.edu. When should I apply to USF? USF does not have an admissions deadline. However, it is in your best interest to apply sooner rather than later to ensure that you meet scholarship deadlines and receive the best financial aid package available. We typically encourage high school students to apply during fall and early winter of their senior year. USF requires that all unmarried, full-time students live on campus their freshman and sophomore year. Exceptions may be granted to students with medical issues or students who live with a parent/guardian in Sioux Falls. USF has a variety of residence halls and apartment style complexes available. Yes! All students can receive parking tags for up to two vehicles for free. We have different parking lots designated for on-campus students and off-campus students. No, you do not need to bring a lap top or other computer to campus, however many students choose to do so. There are computer labs with printers in every residence hall and in nearly every academic building, wireless hotspots all throughout campus and internet access in each residence hall room. Will my high school AP classes transfer to USF? USF issues college credit for AP classes based on a test score of 4 or 5. Visit the AP and CLEP page to view credit for course listings. In order to register for classes you need to submit a New Student Registration card and a $100 tuition deposit. This allows you to attend a New Student Registration Day where you will sign up for classes, take your ID picture, gain access to your USF email account and much more. For fall classes, the $100 tuition deposit is refundable until May 31. Will my classes from another institution transfer to USF? USF accepts transfer credit from accredited post-secondary institutions. Your admissions counselor can help you determine how your courses might transfer to USF. Upon submission of your $100 tuition deposit, our Registrar's Office will conduct an official transcript evaluation. All students accepted for admission for the fall are sent housing applications in the spring. We encourage you to submit your housing application and $100 housing deposit as soon as possible to be placed in your top residence hall choice. Final room and roommate assignments are made during the summer and are mailed out in July. Financial aid makes the cost of education more affordable for students and their families. There are four primary types of financial aid. They are grants, scholarships, work-study, and loans. Can my family afford USF? Enrolling in a college is an investment in the student's future. Families often think they cannot afford a private college education, but we believe a student who is admitted and wants to attend USF should not be prevented from doing so because of financial reasons. While understanding that the primary responsibility for meeting college costs rests with the students and their parents, financial aid programs are available to assist the family in attaining this goal. You should complete the FAFSA as soon after October 1 as possible. Some of the aid programs have limited funding and are given first to students who make the priority date of January 1. When you complete and submit a FAFSA an expected family contribution (EFC) is determined. This federal formula takes into account factors such as family income, assets, number of dependents, number in college, as well as other factors. Your financial aid package is the combination of grants, scholarships, loans, and campus employment opportunities that you have been awarded. How do I learn more about your institutional aid? By submitting your FAFSA and being accepted for admissions, you have applied for institutional aid. There are some scholarships that require additional applications. You must be attending USF full-time (12-17 credits) as an undergraduate student to receive institutional aid. Contact Admissions with further questions at 605-331-6600. Applying for financial aid is voluntary. Filing the FAFSA may enable you to receive additional non-need based federal aid. If you decide not to complete the FAFSA, notify the USF Financial Aid Office so we can review your eligibility for institutional aid and create a financial aid package for you. What is included in the student budget? Cost of attendance includes tuition, fees, room and board, as well as an allowance for books, transportation and any personal expenses incurred by the student. Please contact a USF Financial Aid Counselor at 605-331-6623 to talk about how to cover these costs. How will a scholarship I receive from a community group or school organization affect my financial aid package? If you are applying for financial aid and receive a scholarship from a source outside USF, that scholarship becomes part of your financial aid package and is included in your total aid award. In some instances, it may be necessary to adjust other aid, usually a loan or work-study, to meet federal regulations. Please notify USF's Financial Aid Office as soon as you receive any scholarships from outside sources. What can I do if there has been a significant change in our family's financial situation? If there is a significant change in your income from the prior year, the Financial Aid Office may review your aid. This is only done in extreme cases and it may or may not affect the amount of aid you receive. Notify the Financial Aid Office as soon as possible if your circumstances have changed. One of your biggest concerns might be “How am I going to pay for school?” Our experienced, helpful staff can guide you to many sources of financial aid. Some students qualify for grants and/or scholarships, many can receive loans with a variety of repayment options, and you might even pick up a work-study job on campus. Whatever your situation…traditional, nontraditional, veteran, single parent…we will help you navigate your financial aid options. What are the campus visit options? Campus Preview Days – large group visits providing info sessions about USF, a campus tour and lunch. Create your own visit day – personal campus visits offered Monday - Friday except on holidays. It is best to visit campus during the academic school year between September and May when students are on campus to get a real sense of the community at USF. Most seniors visit campus early in their senior year to get a feel for the environment on campus, learn more about USF, meet their admissions counselor, and become aware of our valuable timeline to keep on track during their busy senior year. The spring semester is a good time for juniors to visit to get a head start on their college search process. Click here to sign up for a campus visit. Please indicate on the form any appointments you would like with professors, athletic coaches, fine arts directors; please feel free to add details in the additional comments section and we will do our best to accommodate your requests. What else can I do during my campus visit? 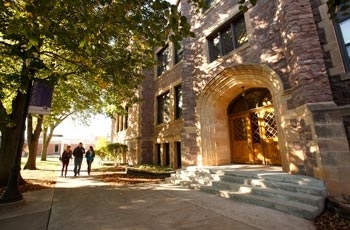 We encourage you to meet with an admission representative, who will talk about admission into the University of Sioux Falls and who can go over the basics of financial aid, housing, registration, and academic programs. If you would like further information about specific academic programs, financial aid, a student organization or other areas of interest, we will be happy to attempt to make an appointment for you with representatives of that area. In addition, you're welcome to visit our campus store, Cougar Central and have lunch in the McDonald Center provided by the Admissions Office. What happens once I schedule a campus visit? Will I receive a confirmation? Once we have received your request to visit, a campus visit coordinator will begin working on your visit arrangements right away. Depending on the number of additional appointments you have requested, it may take a couple of days for us to complete the arrangements. After we have done so, we will send you a finalized confirmation email which will include an itinerary for your visit, a parking pass, and campus map. If we have questions regarding your request, we may need to contact you in order to complete arrangements. Please be sure to provide an accurate email address and daytime phone number. In order to ensure that you receive your campus visit confirmation email, please add the following address to your email contacts list or "safe senders" list: campus.visit@usiouxfalls.edu. If you haven't heard from us at least two days prior to your visit, please call the Admissions at 605-331-6600 or 800-888-1047. What should I do if I need to cancel or reschedule my visit? If you need to cancel your visit for any reason, please call Admissions at 605-331-6600 or 800-888-1047. The Campus Visit Coordinator will help you cancel or reschedule your visit for another day. What is included during an Individual Campus Visit? 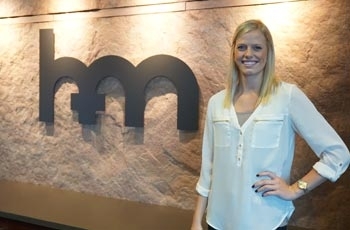 When you visit USF during the week on an Individual Campus Visit you will get the opportunity to meet with an Admissions counselor to learn more about the University of Sioux Falls and the process of applying, take a tour of campus with one of our current students, and meet with financial aid to talk about scholarship and financial aid opportunities. In addition, you can request to meet with a professor in your area of study, talk with an athletic coach or fine arts director, and attend a class that would be required in your major here at USF. Individual Campus Visits typically last between 2 and 3 hours, depending on the number of appointments you request. Individual visits can be scheduled to begin at the following times: 9:00am, 10:00am, 11:00am, 1:00pm, or 2:00pm. What is included during a Campus Preview Day? When you visit campus during one of our Campus Preview Days, you will get the opportunity to get a broad overview of what USF has to offer with a group of students just like yourself and their families, but still have the opportunity to speak with representatives from each department one-on-one if you desire. Campus Preview Days typically begin at 11:30 and last until 3:30pm. During this time, you'll be able to hear more about both the admissions and financial aid process, have lunch in our dining hall, and learn about opportunities in student life and campus ministries. You'll also get to find out more about the typical life of a USF student by asking current students questions during our student panel session and when you are out on your tour of campus. Finally, you'll end the day by meeting with a professor in your academic area of interest to learn more about the field of study you're considering. I have already been admitted and have visited campus. Will I benefit from visiting again? Many students choose to visit campus several times when making a final decision. During February and March our Accepted Student Days focus on information for admitted students, summer registration days, housing, and "Welcome Week" activities. Can I visit during the summer? We know the school year can be a very busy time - so students and their families are more than welcome to visit campus during the summer. We just ask that you keep in mind that most of our students return home for the summer and our faculty, coaches, and directors aren't as available for appointments. So although campus may not be as lively as it is during the school year, we welcome visitors and will do our best to get you the most amount of information from your areas of interest. Can I meet with an athletics coach or when I come to campus? We welcome you to request to meet with a coach during your campus visit. At times we are unable to coordinate a coach visit because of coaching schedules or designated recruiting dead period within the NCAA Division II. If you are interested in participating in a collegiate sport, complete an athletic recruiting questionnaire as you visit http://www.usfcougars.com/. Can I meet with a fine arts director when I come to campus? 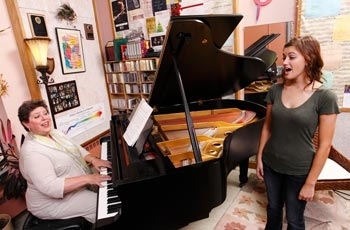 We will make every attempt to schedule a visit with one of the instrumental, voice, or theatre directors to help you learn more about the opportunities available for future students within our fine arts programs. If you are interested in being considered for a fine arts scholarship in band, choir, or theatre, you will need to complete a fine arts questionnaire and schedule an audition time at some point during your senior year. How long will my campus tour last? Tours usually last approximately one hour or a bit longer. Our tours are walking tours and you'll get a comprehensive look at campus, including academic buildings, classrooms, residence halls, recreational facilities, and other areas of interest to you. Who will be giving/leading my tour? Campus tours are led by University Ambassadors who are current students with a variety of backgrounds and interests. They will show you around campus, tell you about their own USF experiences, and answer questions about student life. Our campus tour is a walking tour outdoors, so you will want to wear comfortable shoes want to dress appropriately for the weather. When you come for a tour we will give you a folder with information about USF. Please feel free to bring a copy of your high school or college transcript if you are applying for admissions and would like to bring the most recent version of your transcript we can accept sealed, official documents. Take 41st Street to Western Avenue (about 1.5 miles). Turn left on Western and drive north to 26th Street (1 mile). Turn right on 26th and drive east to Menlo Avenue (about .5 miles). Turn left on Menlo. The visitor lot will be two blocks on the right. Follow the signs for the admissions office and park in the spaces designated with blue visitor parking signs. Take Minnesota Avenue to 26th Street (1.2 miles). Turn left on 26th and drive west (seven blocks) to Meno Avenue. 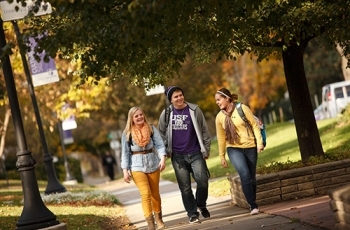 The University of Sioux Falls is a residential campus with a residential student requirement to live on campus for their first two years. Staying overnight is a good way to experience campus life. Please plan to check into the Admissions Office by 5:30 where your overnight host will welcome you, take you to dinner, to any meetings or residence hall activities that he or she may have scheduled for that night. Consider bringing a sleeping bag, pillow, toiletries, and bath towel. Overnight visits are reserved for senior high school students only. Overnight visits are offered on weeknights between October 1 - May 1. We will not be able to accommodate requests during holiday breaks or before campus preview days or final exam weeks. Why should I attend New Student Registration (NSR)? New Student Registration is a time for you to return to campus, wrap up final pieces and register for classes. The day includes presentations from Student Development (Housing), Financial Aid, the Registrar's Office and more. You will also get your Student ID photo taken and may go on a guided tour of campus if you haven't already done so. Throughout the day, you will meet with an academic advisor to create your class schedule. When is New Student Registration? Freshmen and transfer students starting classes in the fall semester will have registration dates in the months of May, June and July. Freshmen and transfer students starting in the spring semester will have registration dates offered during January. Advising dates are listed on the New Student Registration form for students. If you are unable to attend a New Student Registration Day, you may select an appointment option for advising virtually or on campus. How do I register for New Student Registration Day? What if I can't make it to a New Student Registration Day? All new students are expected to attend a New Student Registration Day. If you cannot make it to one of the scheduled days, choose the appointment option on the registration form and provide a few alternative times for meeting virtually or on campus. From there, a course schedule will be built for you and an appointment will be scheduled with an academic advisor to discuss the schedule in person or over the phone. I registered for a New Student Registration Day, and it says a schedule will be built for me - what does that mean? To save time, and to make sure new students begin their academic careers successfully, a preliminary course schedule is built for you. Changes to that schedule can be made during NSR after talking with your academic advisor. Please make sure you have sent us your ACT score and copies of your college transcripts PRIOR to attending NSR, if necessary, (i.e., high school students possessing college credits or students transferring from another college). Unofficial transcripts are okay for now, but to complete the admissions requirements we will require official transcripts. Will I need to take a math placement test? Students with an ACT math sub-score of at least 19 or an SAT math score of at least 480 are not required to take a math placement exam and can enroll directly into any of the math core courses, including MAT112, MAT113, MAT233 and MAT151. Students not meeting this requirement will have an option of taking a math placement exam. A passing grade on the exam permits enrollment in the core math courses. Students who decide not to take the placement exam or who do not pass the placement exam will need to take MAT111 (Elementary Algebra) as their first math course. If you would like to take the placement exam, your academic advisor will provide you with more information, or you can contact USF’s Thomas Killian Academic Success Center for placement test options. Why do I need to take SDV 100: The USF Experience course? Designed to introduce you to college life and help you succeed, this course is required of all first-year students. Many students report that they are both nervous and excited as they launch their college career, especially because they know it will be different than high school. As USF stretches your intellect, you will find a rich support system to help you learn, develop and succeed. That's what SDV 100 is all about. These discussion groups meet during the first eight weeks of the semester and help you make friends, identify your strengths, think critically, confirm your career goals and better understand the mission of a Christian liberal arts university. Why do I need to take SDV 199: Becoming a Master Student? Your first year in college is a fresh start. This course is designed to help you jumpstart your college career by discovering and developing effective learning strategies. Whether it is increasing your testing-taking abilities or managing your time, the assignments and discussions will equip you with the skills needed for success in college and life. Students who are admitted provisionally are required to complete this course, but it is open to anyone who would like to succeed. Should my parents/guardians attend New Student Registration? We encourage parents and family members to attend New Student Registration because they often offer valuable support and are interested in learning more about your new life as a USF Cougar. In fact, we value their partnership and have designed a session specifically for parents, guardians and other family members. The decision is entirely up to you. When is New Student Registration for students starting the fall semester, where does it take place, what do we do and how long will it last? There are five registration dates offered throughout May, June and July for students starting the fall semester. New Student Registration Days start in the Salsbury Science Center, and you are welcome to park anywhere on campus. The morning is designed for you to learn more about Student Accounts, Financial Aid and living on campus. There is also time for you to ask questions, log into your USF email account, tour campus, confirm your housing options, check athletic compliance and even buy Cougar Gear at Cougar Central (the campus store). Lunch is provided in the dining hall, followed by an academic advising session in the afternoon. This is when you will go over your class schedule, make any necessary changes and meet professors from your academic area. Check-in begins at 9:15 a.m. and the day is typically finished by 3:00 p.m. When is New Student Registration Day for students starting the spring semester, where does it take place, what do we do and how long will it last? A New Student Registration (NSR) Day is offered on campus for students in January. Spring NSR Day starts in the McDonald Center, and you are welcome to park anywhere on campus. NSR Day starts in the early afternoon and ends around 4:00 p.m. The day is designed for you to learn more about Student Accounts, Financial Aid and living on campus. There is also time for you to ask questions, log into your USF email account, tour campus, confirm your housing options, and even buy Cougar Gear at Cougar Central (the campus store). You will also have an academic advising session to review your class schedule. What should I do prior to arriving on campus for New Student Registration Day? Send your transcripts of AP, IB or CLEP tests; the PSEO program; or college courses you took through your high school to the Admissions Office to complete your enrollment file. If scores and transcripts are not yet available, please bring with you a listing of the courses/tests. In addition, bring immunization records if not previously submitted and any outstanding Financial Aid paperwork. Yes, if you plan to shop or eat out while you're in Sioux Falls. The campus store, Cougar Central, will also be open for you to purchase books, gifts and USF apparel. What is the difference between New Student Registration and New Student Orientation? When is New Student Orientation, what do we do and how long will it last? New Student Orientation begins with Move-In Day on Saturday, August 26. You may begin moving into your residence hall at 9 a.m. Individual check-in times are based on last name and can be found at www.usiouxfalls.edu/orientation. New Student Orientation begins at 2:00 p.m. If I have specific questions, will offices be open to assist me? During Move-In Day, Financial Aid, Student Accounts, Campus Security (to pick up your parking pass and Student ID) and Registrar's Office will be open. On weekdays, offices are open from 8:00 a.m. to 5:00 p.m.
Why should I attend New Student Orientation? Move into your residence hall. Meet with faculty members from your academic area. Attend helpful sessions about campus life, programs and services. Get your Student ID (take photo if needed). Make changes to your class schedule. If you have additional questions, contact the Admissions Office at (605) 331-6600 or (800) 888-1047 or email us at admissions@usiouxfalls.edu. Additional information can be found by viewing our Fast Facts document. USF Consumer Information can be found here.